I am a fan of restorative yoga. This way of practicing can help with many issues. Many students, including myself, found relief and it also helps with whiplash. Whiplash or neck sprain is caused by sudden backward or forward jerking motion of the head, often as a result of a car accident. The intervertebral joints, discs, ligaments, the muscles and nerve roots in the cervical (neck) area may be harmed. This restorative pose will help to find relief: take an extra long belt around your upper back (see picture), then in front of your shoulders and cross behind your neck. Then pull the ends of the belt down. This gives a pleasant traction in your neck. 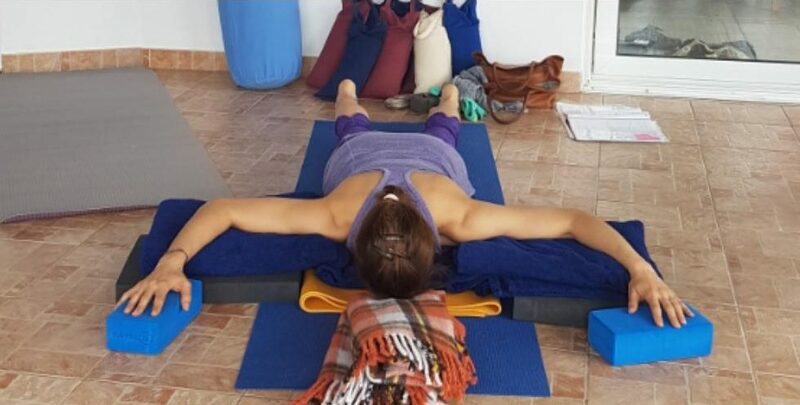 The restorative pose works like this: lie down on your mat, having your torso supported with one or two folded blankets. There should be no pain in your lower back. Legs are not supported. Arms are in ‘cactus’ pose. Shoulders, arms and hands need to be on same level. You can us blankets for support. The forehead rests on a folded towel. Neck and spine are in one line. A helper pulls the belt gently and steadily in direction of heels. If you have another helper, she/he can pull carefully from the base of skull. This gives a nice and gentle traction in the neck.